A few days ago, a new update for Minecraft Pocket Edition was released. 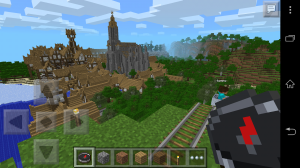 The new version comes with a lot of new improvements, such as the use of minecarts, rails and powered rails. New textures have been added, as well as new crops and food types, including carrots, potatoes and pumpkins. In Creative and Survival mode, there are also some new items, like clocks and compasses. The view distance has been increased, which results in a wider view of this nicer world. Minecraft is one of the best creative games available on the market. It’s a sandbox indie game created by Markus “Notch” Persson and developed and published by Mojang. It was released on 2009 for PC, and currently is also available for iOS, Android, Xbox 360 and Xbox Live Arcade. Currently, the game had already sold over 33 million copies across all platforms. Minecraft fuels the creativity, as players build constructions using textured cubes in a 3D generated world. In addition to that, the game also includes exploration, gathering of resources, combat and crafting. 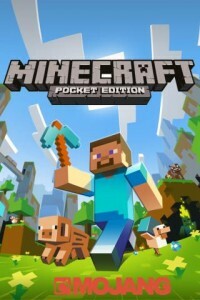 This Pocket Edition has: Survival and Creative modes, multiplayer and randomly generated worlds. The most difficult aspect of the game is the lack of information. There isn’t any information at all inside the game, and you have no clue about what to do unless somebody explains you the basics. The good part is that there is a huge community of users actively participating in online forums, wikis and communities, with lots of pages with all kind of information needed. Sometimes, small recipes inside the game would be most welcome for the newbies! Since its release, the game has been updated every few months, with lots of new features and improvements every time. Minecraft Pocket Edition is available for $6.99 on iTunes and the Play Store respectively.